Come dressed to impress. The team with the best costume will win a special prize. Depending on the number of teams, the tournament will be either single or double elimination. If the tournament is a single elimination, those that lose are welcome to continue to play for fun! Hopefully those that are still in the tournament are also having fun. 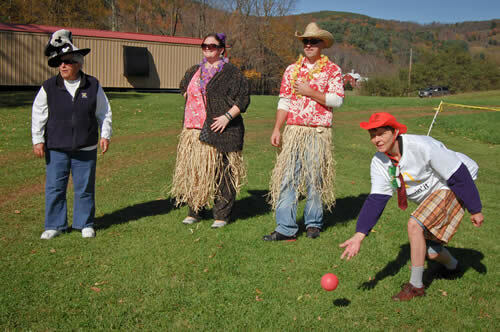 Your team can contain two to four players — the competing team with the most players will be given all advantages of play (choose color, throw first pallino, throw first bocce). Ties in play and in costume contest will go to the team with the most players. Registration is free! Just show up the day of the tournament to play. The tournament starts at 1:00 pm Saturday. Each player must pay admission to the festival. Winning team gets gift certificate to the Andes Hotel. Best dressed team gets gift certificate to the Shire Pub. Bocce balls generously provided by Ray’s Fine Wines and Spirits.